Tommy Taylor is the main character in a series of fantasy novels that have become a cultural phenomenon. Fans gather on websites and at conventions to celebrate his magical stories and hope that his missing creator, Wilson Taylor, will someday resurface to write one last adventure. But there's one dangling plot thread: the real Tom Taylor, the son Wilson abandoned. The inspiration for the magical boy wizard, Tom is now worshipped worldwide as a literary legend made flesh. 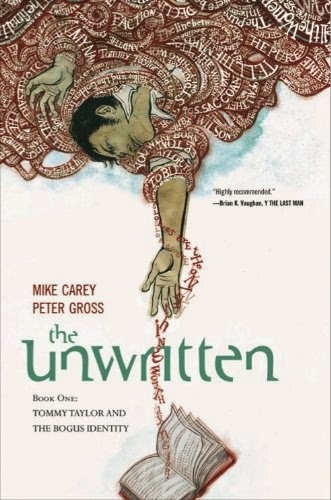 As Tom's life begins to take on eerie and deadly parallels with Tommy's, he's drawn into a strange literary underworld where the power of storytelling is as strong as any spell. The premise of this is exciting, and it's shaping up to be a really interesting read for me. Tommy Taylor seems to have leapt from imagination into reality, but is still denying this for the time being. The theme here is that the stories we tell shape our reality, and that they are a lot more powerful than we could ever imagine. Perfect. I really liked the snippets of the Tommy Taylor novels we got to experience here; they had funny little hints to JK Rowling within them, along with some smaller references to other fantasy novels. Another highlight for me was Tom's father teaching him all he knew on literary geography - we saw or spoke of Room 101, the Reichenbach falls, Pianosa, and Villa Diadato. The idea that this geography of stories comes into play much more later in the series intrigues me massively. The most intriguing part of all is, that if Tommy's father created him in Villa Diadato, which also housed Shelley and Milton, then both Lucifer and Frankenstein are his uncles, or siblings. The final issue in the volume focused on Rudyard Kipling, his life, and the fact he had been approached by the same secret society as Tommy's father. Their motives are unclear at the moment, however they manipulate writers into creating stories which have an effect on reality. Despite being a fantasy novel, some of the scenes seemed very real. Carey and Gross manage to capture the mindset of the 'superfan'; either glorifying or castigating Tom as they saw him either as a fraud, or the messiah. I also really enjoyed the depiction of a literary convention at the beginning of the novel; it's strange to see something so familiar jump out at you like that. Although not without its faults, which were too minor to mention, this is a promising first volume, The literary references are delicious to me, and the idea of fiction impacting reality makes me want to move on to the next volume immediately. Which is exactly what I'll do.